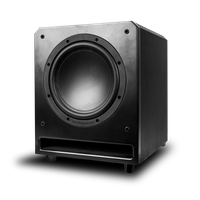 Powered slot subwoofer with 10" driver, 150W internal amplifier. Sold each. Powered slot subwoofer with 12" driver, 250W internal amplifier. Sold each. Powered slot subwoofer with 8" driver, 100W internal amplifier. Sold each.